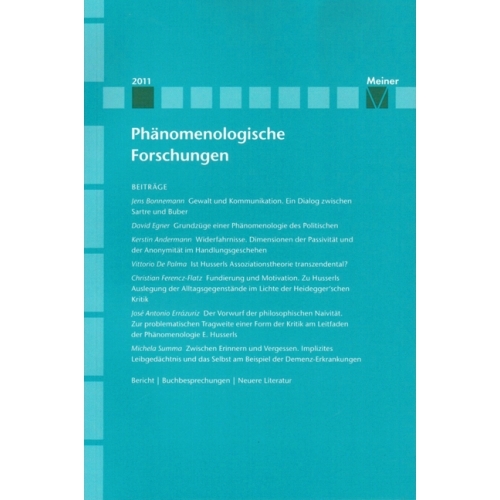 Phänomenologische Forschungen 2011. 2011. Herausgegeben im Auftrag der Deutschen Gesellschaft für phänomenologische Forschung unter Mitwirkung von Julia Jonas. 249 Seiten. Vittorio De Palma: Ist Husserls Assoziationstheorie transzendental? In ethics, when discussing problems of justice and a just social existence one question arises obviously: What is the normal case of the relation between I and you we start from? In moral philosophy, each position includes basic socio-anthropological convictions in that we understand the other, for example, primarily as competitor in the fight for essential resources or as a partner in communication. Thus, it is not the human being as isolated individual, or as specimen of the human species or socialised member of a historical society what needs to be understood. Instead, the individual in its relation to the other or others has been studied in phenomenology and the philosophy of dialogue of the twentieth century. In the following essay I focus on Martin Buber’s and Jean-Paul Sartre’s theories of intersubjectivity which I use in order to explore the meaning of recognition and disrespect for an individual. They offer a valuable contribution to questions of practical philosophy and the socio-philosophical diagnosis of our time. The article seeks the cognition of the essence of the political through the phenomenological analysis of its object.With reference to Kant, Schopenhauer and Husserl, the article first clarifies how the world is constructed in human consciousness, thereby differentiating three levels of constitution. In a second step it shows respectively how specific motives of action are constituted on these three levels, deducing three ideal types of human action. In a third step, the phenomenological analysis is extended to the political, understood as collective action, following Hannah Arendt. For a collective action to be constituted, beside the acts of consciousness necessary for the constitution of individual action, the acts of articulation and representation of the common will are required. It can be shown that it is the political institutions of the executive, legislature and judiciary which represent this will on the three differentiated levels of constitution of action. The discussion over the befallenness (Widerfahrnis) of experience illustrates how the philosophical tradition has substantially assumed an active and conscious subject. The constitutive meaning of the pre-egoistic and passive, anonymous dimensions of perception and agency become apparent through what befalls us, what we are suffering from, through befallenness, accidentalness and events beyond our control. 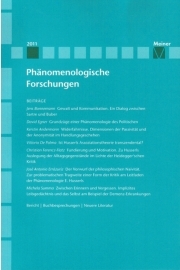 This article deals with the status of the sovereign subject through a critical discussion of the principles of intentionality and the constitution of world in transcendental subjectivity, showing the development of phenomenology, above all between Husserl and Merleau-Ponty, as emphasising passivity and anonymity. This paper deals with Husserl’s theory of association and tries to show that this theory originates from a critical confrontation with Hume and represents a development of the idea of eidetic material legality, since for Husserl associative connections are relations of ideas based on the peculiarity of contents. I stress that Husserl distinguishes two types of conditions of possibility of associative synthesis: subjective-formal (pertaining to consciousness) and objective-material (pertaining to contents) conditions. Thus the last grounds of the associative constitution (and therefore of the constitution of the world, that for Husserl as for Hume is based on association) don’t lie in subjectivity, which is only the formal condition of the associative synthesis, but in the particularity of the sensuous contents and in their immanent legality. This also follows from the hypothesis of world-annihilation. After a discussion of Husserl’s thesis that associative contents are immanent and of the phenomenological concept of constitution, I conclude that – properly speaking – Husserl’s theory of association cannot be defined as transcendental. In several of his early lectures and also in Being and Time, Heidegger rejects the traditional conception of “cultural objects” as objects comprising a primary layer of natural thing-reality and a secondary, subjective layer of value, opposing it a concept of “meaningfulness” as an immediate sense structure of situational life-experience. In opposition to the traditional concept, often associated in a more or less overt fashion with Husserl himself, Heidegger stresses that the foundational relationship we are dealing with here is actually directed the other way around: meaningfulness is not founded in natural reality, but instead the latter already presupposes the former. The present article aims to question this heideggerian critique by analyzing the concept of „foundation“ employed by Husserl and by tracing it’s evolution from the Logical Investigations to several later notations from the 1930’s, in order to obtain a more nuanced understanding of the term. There are some relatively good reasons not pay special attention to the concept of naivety in the context of husserlian phenomenology. The husserlian use of this concept may be characterized rather as an auxiliary than as a technical one, for it doesn’t seem to play any decisive role when it comes to phenomenological analysis as such. The concept in question gains nevertheless in argumentative importance when it comes to the husserlian evaluation of philosophical tradition as well as of some competing philosophical schools. An analysis of the concept of naivety may thus allow us to approach an hermeneutical dimension of Husserl’s phenomenology. The first part of the following article offers a tentative reconstruction of Husserl’s usage of the concept in question whereas the second one discusses some hermeneutical difficulties related to its systematic use. The present article explores some currently disputed issues regarding the relationship between temporality, memory, and the self. To exemplify and to concretely examine the problems under consideration, a phenomenological analysis of dementia illnesses is proposed. The first objective of this article is to develop an appropriate concept of the self, apt to describe the experience of dementia patients. To this aim, the different positions in the debate regarding the preservation of the self in dementia patients are first critically assessed. Subsequently, it is shown how the phenomenological distinction between the basic sense of self, often indicated as the minimal self, and the higher forms of narrative self-consciousness and identity can fruitfully contribute in this debate. The second objective of the article is a more concrete qualification of the minimal self. Particularly, the determination of the minimal self as un-extended in time is challenged. On the basis of the phenomenology of time and implicit bodymemory, and still exemplarily referring to the analysis of dementia illnesses, it will be argued that a concrete description of basic self-experience necessarily needs to take its spatio-temporal unfolding into account.